So after my 1st attempt at recording a “demo” of one of my songs I quickly realized that guitar & vocals was not going to be enough to satisfy me. What I want to accomplish is to make my songs complete, not perfect, but enough to where I can listen to & enjoy them in the car, not much of a goal I suppose, but that is what I want. In a way it is remarkably freeing seeing making music like this though. I am not making music to try & please anyone, I am not trying to get famous or anything, I am just trying to enjoy myself & get a kick out of it being my on my radio, just like you get a kick when it is you on the tv, even if it is a home movie. So in order to make a full song I knew I needed to get some new things, yay toy buying. Now in order to combat my annoying ability to fall in love with the most expensive pro kit available, I set myself a budget & the challenge of coming as far under it as possible. If you are unfamiliar with how crazy expensive musical equipment can get, let me give you an example, the industry standard microphone for recording vocals, the Neumann U87, will run you a cool $3599.95 on musiciansfriend.com today. Then you will need a pre-amp to power the thing, a good one of those, say the Neve Portico 5017 mobile, then will run you a good $1050 (my next purchase, oh yes, it will be mine), unfortunately more than the entire budget I set myself. So my challenge, was not only getting over myself to not fall for stupidly expensive equipment, but to get what I “needed” for as little as possible. First up, I needed to figure out a way of making drums, I made the connections to Cubase by midi with my keyboard. But to be honest, I don’t know enough about what goes into making up a good drum track to even begin to make it by playing each part separately on the keyboard. I tried, it sounded terrible. So I could spend a whole bunch of time perfecting my technique, or I could buy a drumset & spend a couple of years learning the drums, or, given that I don’t really want to be a drummer, I can look for a 21st century solution. We are so crazy lucky to live when we do, yes I know that the world is a scary dangerous place today, but it is still awesome. Anyway, I talked to a friend who told me about ezdrummer, a software program that has midi drum loops & sampled drum kits that works as your drummer for you in as a plug-in in your DAW software. While researching that I also found a similar program called Addictive Drums. 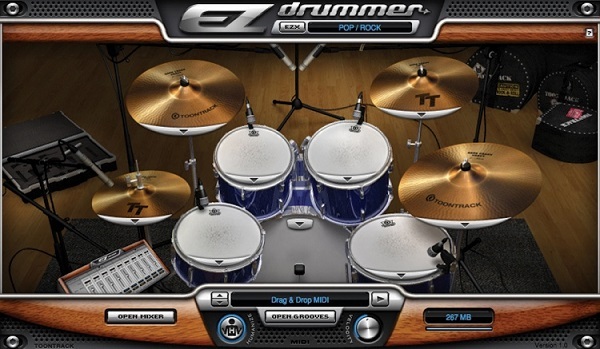 Both programs looked good, ezdrummer looked more intuitive, while addictive drums looked like it has more depth. The price was the same, until I checked Amazon on the right day, Ezdrummer was on sale, 40% off, decision made. It turns out there is a whole world of fake drummer software out there. Now don’t get me wrong, I know that a real drummer is incomparably better, but in that this is just a personal project / exercise, I am ok with fake drums. Next up was a bass, again I have played bass parts previously using a keyboard, you can get the basics in but it does not sound right. So after some research & consulting my bass playing brother in law, I picked up a Yamaha RBX170EW for over 30% off list. I don’t know much about basses, but it seems to be pretty good, especially considering the price. 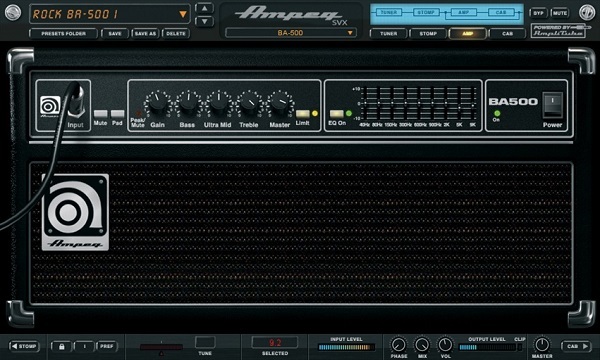 To aid the bass process I got the IK media Ampeg SVX plugin, this is a digitally modeled set of bass amplifier’s & effects, again not being tuned to how a bass should sound, I can only say good things about how great it sounds. Last, but certainly not least, I was recording vocals with a dynamic microphone, no bueno. So I got a cheap condenser mic & a pre-amp. 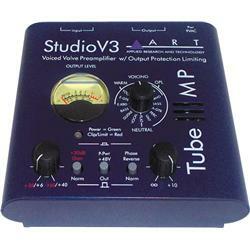 The pre-amp needs to go back, ART-Pro V3, the VU meter on it does not work & it is awfully noisy. I knew it would not be perfect for the price, but it should at least do what it says it will. For the mic, I got an MXL 67G for a whopping 65% off. I decided on this one because there is apparently a mod you can get for around $500 that will make it almost identical to the aforementioned Neumann U87. I have no intention o doing the mod, but I figure if the design is close enough to where you can mod it to be almost identical, then it is the right choice from the vast sea f budget condenser mics. So there you are, I am all upgraded, guess what the next post will be? The downside of doing a full mix song, especially including drums is having to consider tempo. As a guitarist everything is about feel, when I first started playing I was a much better student of music, today it is all feel. So when it comes time to set the drums up, realistically the first thing you do, it is a stop & pause moment. I have no idea what bpm or timing key my songs should be, none, I don’t even know how to figure that out, for once google wasn’t much help either. So what did I do? I cheated of course! The song I was working on to learn how to use my new tools was close enough in design to Eddie Cochran’s C’Mon Everybody that I looked up what that song’s bpm was & set mine pretty close to it. When you have just drums going, it is really hard to figure out what is enough or what is too much, that is going to be a big learning curve for me making music. Also figuring out how to manipulate the software to make the tracks I want, the drums on my next demo are not what I had in my head, they are good enough for learning though. One thing with ezdrummer, it is a great program, but they set you up like crazy to buy as many of their expansion packs as possible, I already have my eye on 2 or 3 of them.